In early adolescence, the parts of the brain that control emotion and judgment develop more quickly than at any other time. Students between the ages of 10 and 14 easily find connections between the literature they read and their own lives. 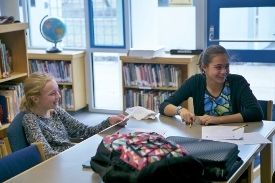 The Middle School curriculum responds to these developments with increasingly challenging reading and writing projects. For example, in Grade 5, students use their growing understanding of personal interactions to make predictions about characters in novels set during the American Revolution. Fifth graders also read Sharon Creech’s Walk Two Moons and are guided into using emerging higher-order thinking skills in this challenging literature. Grade 6 students spend part of the year reading the novel The Giver, which challenges them to consider the values dictated in a fictitious utopian society. To exercise their emerging ability to learn from literature on multiple levels, students create their version of a perfect society, and reflect on both simple and more complex questions of morality. Another selection sixth graders read is Frances Temple’s Taste of Salt, a story of two Haitian teenagers striving to inspire hope in a nation who has suffered from a corrupt government. Students show immense empathy during this unit of study and often are inspired and driven to develop a service learning project to benefit Haiti. In Grade 7, students read Sherman Alexie’s The Absolutely True Diary of a Part-Time Indian to consider themes of friendship, loyalty, and the challenges of being part of a minority culture in American society. Seventh LA literature is tied to world geography, with students progressing throughout the year to books set in different geographic regions. Among other themes, students discuss the ways geography, topography, and literature intersect to influence American culture and other cultures around the world. Eighth grade literature is almost entirely adult level, starting with American classics, such as Of Mice and Men and To Kill a Mockingbird and ending with classic and current science fiction. Students read a commercially published memoir of their choice and follow that by writing their own memoir chapters, a creative way for students to reflect on their experiences and accomplishments as they prepare for high school. In addition, Middle School students increase their competence and independence in speaking, listening, reading, and writing. They expand their capacity for deep thinking about all aspects of language, including grammar, vocabulary and spelling concepts. They develop the willingness and ability to consider ideas different from their own. As a result, Green Acres graduates earn consistent accolades from high school teachers and are prepared to tackle the most demanding literature and ideas as they progress in school.